This is a really strange one. 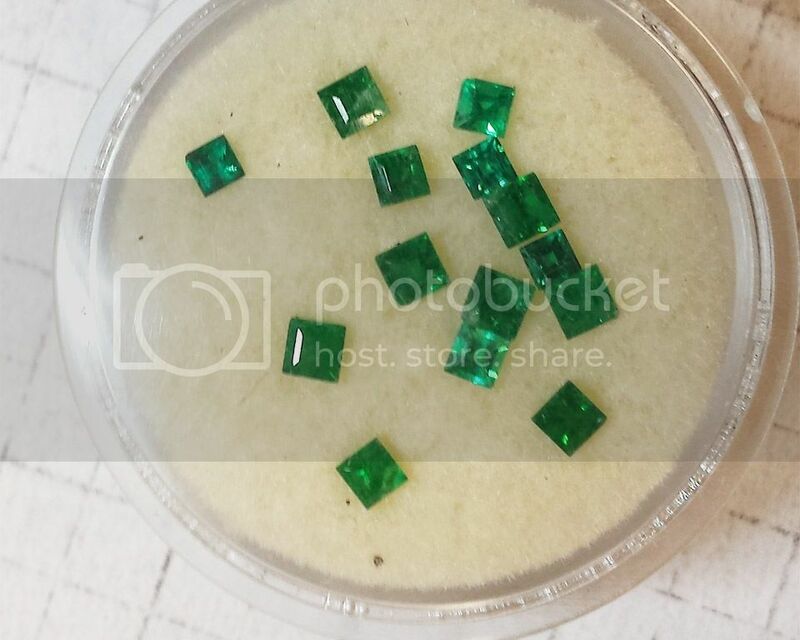 I have a Dino-Lite microscope I use to take pictures of jewelry and gems, and I put some Emeralds under it yesterday. For some reason, 3 of them appeared red while the rest looked normal. I took a picture with my cell phone and the stones came out looking exactly as they do to the naked eye. I'm very curious as to what might be causing this behavior. Any ideas? Last edited by ArdenJewelers on Thu Sep 11, 2014 12:48 pm, edited 1 time in total. Is it just me? The photos don't show . Emeralds which are very low in iron will fluoresce red (and though many synthetics lack iron and will fluoresce, it's not a good indicator because many natural emeralds will as well). Human eyes are more sensitive to green (see: usumbara effect), so even though it's fluorescing red it will likely still look green to you, but the camera doesn't necessarily see things the same. If you want the photos to show, you'll have to host them somewhere public (the google file links are only viewable by you as far as I can tell). I'd recommend imgur.com, there's also a guide right to the left of the screen ("how to post a picture") that will show you how to use imageshack. Hi, sorry about the photos. They should be working now. My first thought was fluorescence as well, but they all looked the same under our UV light. Maybe I'm just missing it? Yep, can see photos now. The red definitely is fluorescence. Maybe the camera has low sensitivity to, or the light source has low output over, an entire band of green wavelengths, so that the red becomes more apparent. Notice how two other stones look blue-white, as if the green has been bleached from them. Ok, so it seems like fluorescence is the consensus. I just wish I knew why it didn't fluoresce that way under our UV light. Oh well. Thanks everyone for the help. I appreciate it. The LWUV wavelength (350-360 nm) is not the correct range to create maximum fluorescence from emerald. (Using crossed filters technique) you can get much better fluorescence reaction from blue-violet light (500-400 nm). Just by looking at the blue cast of the white background in the first photo, we can assume the light source is a "white" LED light source that has a bright blue peak in it. Thus this light will tend to highlight the blue transmission through an emerald and can also create a strong fluorescence reaction. Now the eye, which is very sensitive to green light, may not notice the enhanced blue or red light. But, as Scaro says, a camera that does not see green as strongly as human eye may detect the enhanced colors. 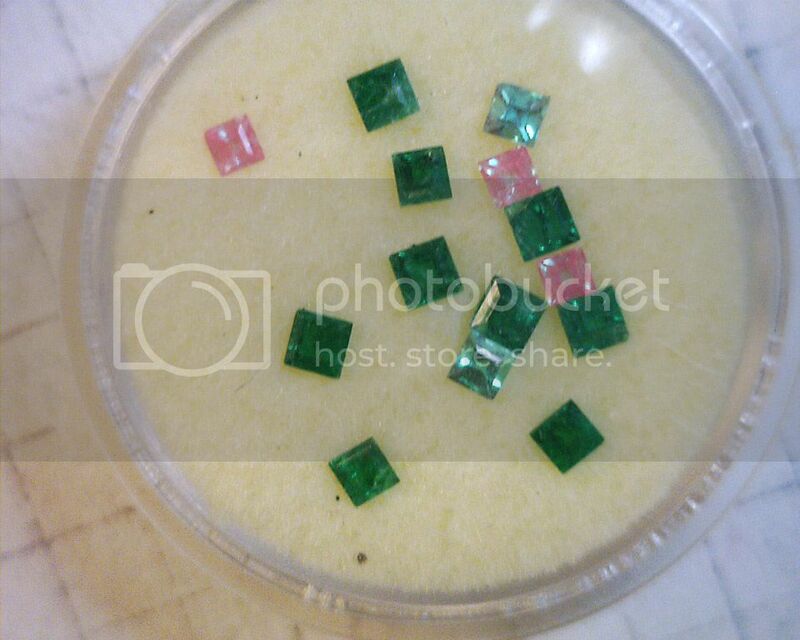 As an experiment, look for an emerald that does react significantly under UV light. Then in a Dino-lite photograph, it should show up much more red compared to the pink seen in the photo above. I believe it is due to the differences in wavelengths of the light sources. This can be reconized by using filters, as in the Hanneman-Hodgkinson Synthetic Emerald Filter Set. Are you sure all the stones are natural? I believe Brian was planing to have some student study this and I sent him a filter set. However, I have not seen any results. I believe it is due to the differences in wavelengths of the light sources. Undergraduate research is slow! The filter set is still on the agenda of pending projects. Thanks for the helpful info. The photos were taken under fluorescent light, but the desk lamp that contributed most the light does appear to be more on the blue side of the color spectrum. To answer your question, we haven't tested them to make sure they are natural, so I can't say for sure. That group came in a parcel we bought several years ago, so I tend to think they are natural but again, we're not 100% sure. I'll see if I can find one that fluoresces under our UV light and then see how it looks under the Dino.